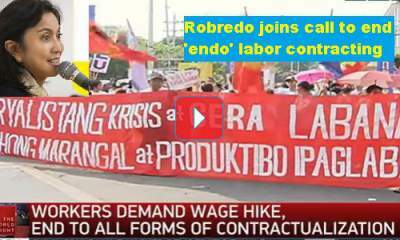 Leni Robredo said that ‘Endo’, or end of the contract that refers to the practice of hiring workers for five months at a time must be stopped. The practice hinders workers to qualify for employee benefits. This is condemned by the VP as labor abuse supporting the President’s pledge since 2016. However, Du30 turns to oligarchy as the culprit for labor malpractices. Will Robredo also join who is know to be funded by oligarchs? [VIDEO]: Various worker groups and trade unions held Labor Day protests across the country. They called for a wage hike and a stop to illegal contractualization. Robredo added that it is not enough just to recognize the importance and the contribution of labor to the growth and improvement of the economy. The government like herself should focus more on their rights and welfare. She said it herself that it is time to go back to labor reforms that aid the progress of the people like perhaps during the Marcos regime? In his speech at the People’s Park in Davao City, the president gives the ‘oligarchs’ a deadline to return government lands to the people. He threatens them that he would allow the Filipino people to take-over the government lands they illegally managed without paying taxes. Du30 criticizes the oligarchs who enrich themselves at the expense of the people and declares that they must be stopped. An estimated 5,000 laborers from both government and non-government organizations attended the event. Robredo’s riding on with the president now becomes a conflict of interest for her. The woman who claimed that she does not have money but ended up spending half a billion of pesos for her vice presidential campaign during the 2016 elections, cannot fool the people anymore. Her SOCE says it all. She is well-funded by the oligarchs and it continues now while she faces Bongbong Marcos’ electoral protest.